31 “In your vision, Your Majesty, you saw standing before you a huge, shining statue of a man. It was a frightening sight. 32 The head of the statue was made of fine gold. Its chest and arms were silver, its belly and thighs were bronze, 33 its legs were iron, and its feet were a combination of iron and baked clay. Unspecified in the Bible narrative. Simple lighting from above left illuminates this scene. From left to right: The statue in the king’s dream, king Nebuchadnezzar and Daniel. 01) (This page) Daniel 02 – Daniel interprets the dream – Scene 01 – Statue (Green version). In which the dream image background is green in colour. 02) (Next page) Daniel 02 – Daniel interprets the dream – Scene 01 – Statue (Blue version). This is the same picture, except that the dream image has a dark blue background, with stars in the sky. 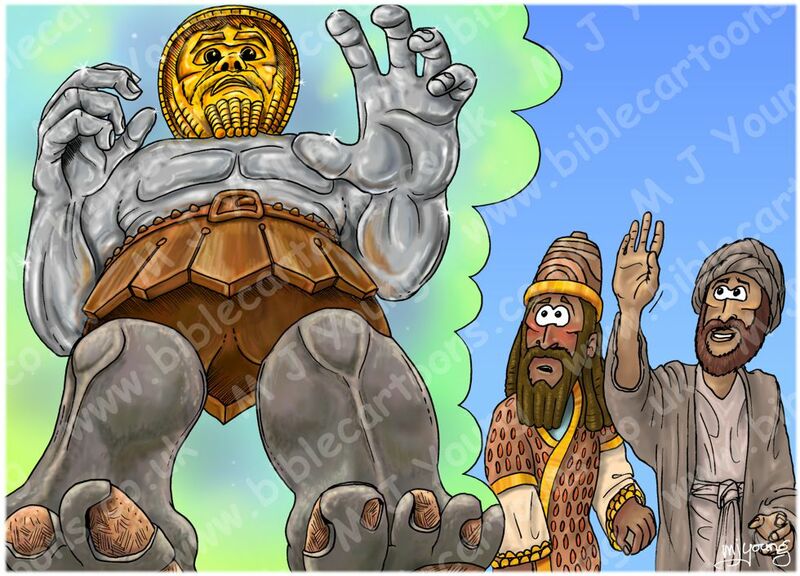 I have seen a few illustrations of the statue in king Nebuchadnezzar’s dream which usually show it from the front or side and they don’t look particularly awe inspiring or frightening to me! Daniel 2 verse 1 states that the king was disturbed by the dream, so I thought I’d draw a vastly foreshortened statue, as if we (the viewer) were before it, and have the thing towering over us, looking down and reaching down towards the viewer. I think that would be a lot more disturbing! If you look at the king’s expression I think I’ve managed to show him looking disturbed! 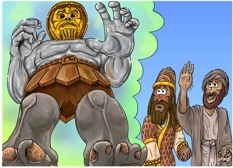 I enjoyed drawing the various different elements of the statue: the shiny gold head, the highly reflective silver chest and arms, the bronze belly and thighs. I decided to draw the iron of the legs as pitted, rough iron, but not rusted. Similarly the feet have the same look, with the baked clay appearing as random pieces interspersed in them. Although I drew king Nebuchadnezzar in early 2010, the scenes in which he appears are heavily influenced by the colours from the fiery furnace, and so his clothing, skin and hair colours were not properly established at that time. I have now created a character sheet, with his clothing, skin and hair colour noted, so that I can create matching colour schemes in all future scenes, which greatly aids continuity of design, regardless of how long it is between drawings.